You can find all the information about these albums and about Polyfoon on their website www.polyfoon.be. Emmanuel Noisette De Crauzat (ENC): please give us some information about the choir (its history, organisation, membership etc), about its director and about the music that you sing. 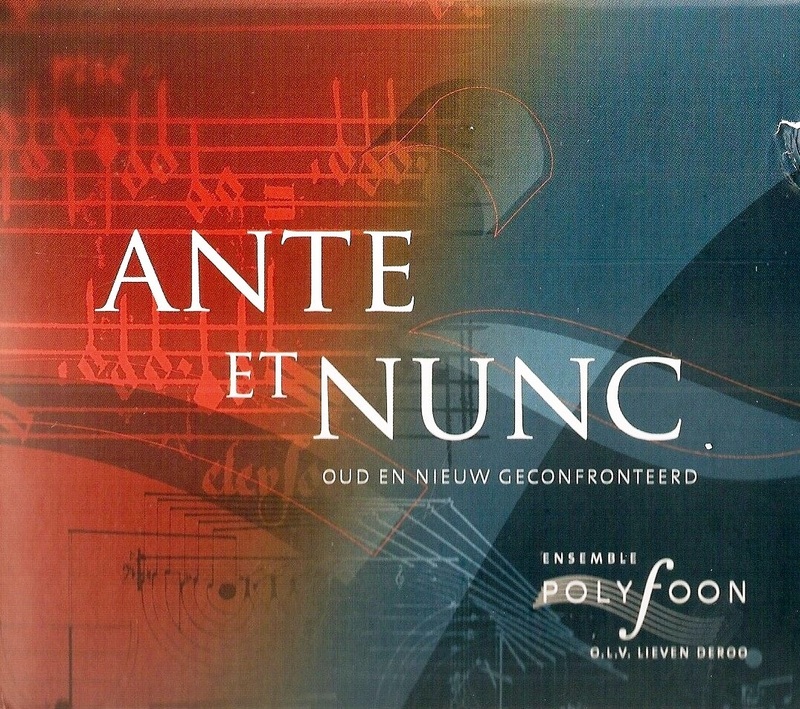 Johan GEERTS (JG): in 2009, Ensemble Polyfoon was ten years old. We celebrated this with the recording of our third CD, Triptic. This CD comes with a booklet showing all the highlights of our first decade. 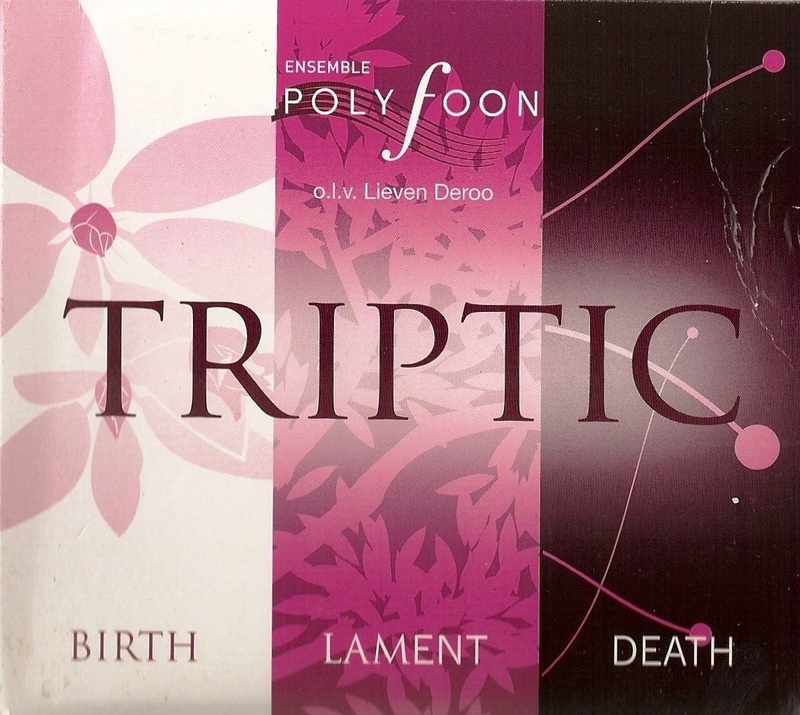 Ensemble Polyfoon is a group of approximately 24 singers specializing in old and new polyphony. Our mission is to sing this a cappella polyphony and combine it with other music or art forms. In original cross-over projects we collaborate with actors, painters, composers, other singers (Russian orthodox music, plainchant, etc), pop musicians (K’s Choice), etc. In each vocal section there are six singers, divided into high and lower voices: three high sopranos, three mezzo sopranos, three altos, three low altos, three high tenors, three high baritones, three low baritones, three deep basses. Our conductor is Lieven Deroo. He is a professional singer and a member of the only fully professional choir in Belgium, the Flemish Radio Choir. He is/was a member of some famous vocal ensembles: Huelgas Ensemble, Capilla Pratensis, Ensemble Psallentes, Currende, etc. The organisation is very simple: Lieven is responsible for the musical direction, I’m responsible for practical organisation and for artistic vision and new projects. Dirk – baritone and graphic designer – is responsible for communication and promotion. From each group of voices (SATB) someone is appointed to liaise between Lieven/myself and the singers. ENC: when did you decide to record your choir, and did you decide to publish the recordings right from the beginning? 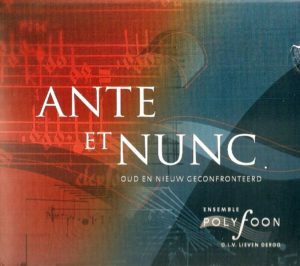 JG: Our first CD ‘Ante et Nunc’ is the result of our first five concert years. It’s an overview of our first concert programmes, a combination of known and unknown and old and new polyphony. The ‘hit’ of the CD is ‘Miserere Mei’ by Gregorio Allegri. We tried to find a commercial distributor for this CD but none were forthcoming, so we decided to produce it on our own and find some distributors. This, too, turned out to be a problem, and in the end we decided to do everything ourselves, and it was a huge success. We sold nearly 5 000 copies of this first CD! In a small market as that of classical music, this was a great achievement! ENC: is the financial aspect important for the recording process? JG: Of course it is. Among our strengths are the graphic design and our promotional tools. The booklets and the packaging of our CDs are well designed with a lot of attention to making clear our overall mission. All our concert posters are published on our website. For some of our ‘fans’, these became collectors’ items. Hiring a good recording engineer, renting a perfect recording venue, mastering, producing and pressing the CD, promotion … If you want to launch a quality product you have to invest a lot of money. When you have recorded a CD, in the beginning the stock is ‘dead money’, you have to invest the whole production cost in advance and you have to hope it will be a commercial success. ENC: how do you organize your recording sessions? JG: Recordings are planned over a year in advance because of the availability of the singers and the conductor, with two sessions in spring and one in autumn. It is very important to release CDs in November, because of the winter holidays and Christmas. Our last recording session was in October 2008, with the editing being done in November 2008. Not every singer is involved in each piece of the CD, so good planning is essential to avoid wasted time. Also good financial planning is important! Subsidies from the Flemish Government were requested several months in advance. ENC: how do you decide on the repertory of your recordings? JG: The repertory is typical for Ensemble Polyfoon. As I said, we always try to combine old and new a cappella polyphony. It’s just like that on this latest recording. The CD is the result of a year-long project in 2007-2008. 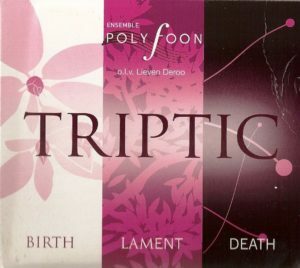 ‘Triptic’ was a triptych with six concerts with music for Christmas, Easter and All Saint’s Day. The concerts were spread over a year. We collected the most beautiful and representative pieces of those concerts including two wonderful compositions specially written for us by two young Flemish composers, Willem Ceuleers and Geert D’hollander. This is also typical for ensemble Polyfoon: we often commission works from young composers who are working in the old polyphonic style or who are writing music referring to this style. This recording is definitely a typical Polyfoon production: a combination of old and new polyphony. ENC: your choir has recorded several CDs. Do you think that some things evolve concerning the process and the result? JG: Yes, the first CD was an anthology of our first five years with highlights such as Allegri’s ‘Miserere. The sound and result is very good, you hear all the qualities of the group, but it’s not that mature. Our second release was a themed CD with music for Holy Week and Easter, a combination of plainchant and old and new polyphony. It’s a beautiful CD but the music is typical for only one season of the year. The third CD ‘Triptic’ is mature and contains both known and unknown music from old and new times. The group of singers has been constant for by now more than five years. It’s clear this CD is the most accomplished one, a clear programme with a clear structure, the result of ten years of hard work. Also enclosed with the CD you’ll find a booklet describing the highlights of our first decade! It brings back memories of all our concerts, concert trips and recording sessions with beautiful pictures, comments by fans, etc. ENC: for the next recordings, what will you want to change about the organization of these recordings? JG: Not much. I think it’s important to combine known and unknown music. 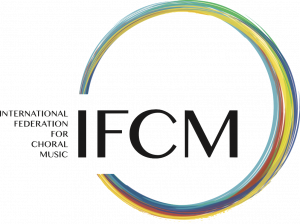 New music by contemporary composers is also important. We believe we have something to give to our listeners: a nice booklet, very extensive information and beautiful artwork. A CD has to be something to cherish, not only for those who produce it but also for those who buy it. ENC: can you make some suggestions to other choirs? JG: If Ensemble Polyfoon is successful, we can say this is due to our remaining true to our philosophy and to being faithful to our mission statement. Everybody knows what Ensemble Polyfoon stands for! We will never sing with soloists, never work with orchestras or instruments. We sing a cappella polyphony from old and new times to a very high standard. There are a lot of choirs who sing all kinds of music: polyphony, baroque, romantic, close harmony, contemporary music … Ten years ago we chose to sing a cappella polyphony, and we keep doing just that. We combine this music with other arts or kinds of music in cross-over projects, but we will never abandon our mission of giving our concert audiences and CD customers quality in all aspects of producing a concert or a CD: repertoire, artwork, quality of voices, quality of music, quality of performance, location, promotional material. Everything has to be high quality. Otherwise you’re not fair to your singers, your fans and your customers.